Vacancies and 40 Accounts Officers Jobs in NFL. 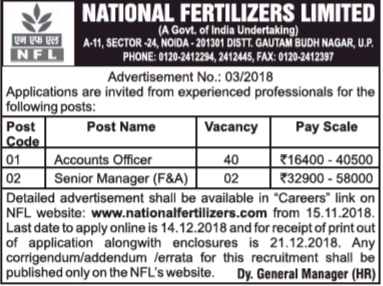 NFL is a MINI RATNA and premier Fertilizer Company engaged in manufacturing and marketing of fertilizers and other agricultural inputs, is looking for dynamic & result oriented candidates for manning the following position for its various Units / Offices. Interested candidates can apply online for this NFL Recruitment of Marketing Representative Jobs from the date 14/11/2018 to date 14/12/2018. For Accounts Officers Jobs last date to receipt of application copy to NFL is 21-12-2018. No. of vacancies allotted to corresponding positions, qualification details and selection procedures are described below for this NFL Noida Recruitment of Marketing Representative and Accounts Officers Jobs. There are total 42 vacancies are available in this current recruitment of NFL. Candidate Upper Age limit is 30 years as on 30/04/2017 (closing date of receipt of application). Relaxation in Upper Age limit will be provided as per Govt. Rules. 1. General reservation for SC / ST / OBC as per government policy. 2.The registration fee will not be collected from above-mentioned category. And also no fees for Departmental candidates. For Marketing Representative Rs.200 /- to be paid per application form and free application for SC/ST/PwD candidates. Selected candidates will be placed at the minimum basic pay in their respective pay scales. Besides basic pay candidates will also be paid, Dearness Allowance, House Rent Allowance / Company Accommodation and will also be entitled for other perquisites & allowances /benefits such as leave, medical treatment, Provident Fund, Gratuity, Pension etc. as per company rules in force from time to time. For the post of Marketing Representative Candidate must have completed B.SC Agriculture from a recognized university. For Accounts Assistant should have qualified CA/CMA or MBA with Financial Management and 1 year experience is required. Candidates should have completed their Graduation up to the closing date of receipt of applications. Candidates are required to upload the scanned copy of following documents, without which their application will not be accepted. 2. Graduation Degree/ Provisional Certificate/ Mark sheet. 3. Caste Certificate, if applicable. For Marketing Representative Posts of NFL Recruitment Selection is based on written test only. For Accounts Officer Online test and Personal interview will be conducted. Candidates who meet the educational qualification can be able to appear for Online Written Test. No further interview for candidates for the corresponding posts. Selection solely depends on the merit basis of the written test. The written test is of objective type only. 1. Written exam will be conducted in Hindi and English. 2. Test duration will be 2 hours. 3. Written test consists of two sections, first section contains Respective field and next section is Aptitude. 4. Total 100 questions will be asked. Out of which 50 questions will be from respective curriculum and 50 questions are from Quantitative Aptitude, Reasoning and General knowledge. Candidates can submit the application online using the official website of NFL. http://www.nationalfertilizers.com from 14/11/2018 to 21/12/2018 for Marketing Representative Posts. Our website Govt Job Online presents latest recruitment notification of 2018 for all State and Central government jobs. we broadcast our focuses on banking and Railway jobs too.